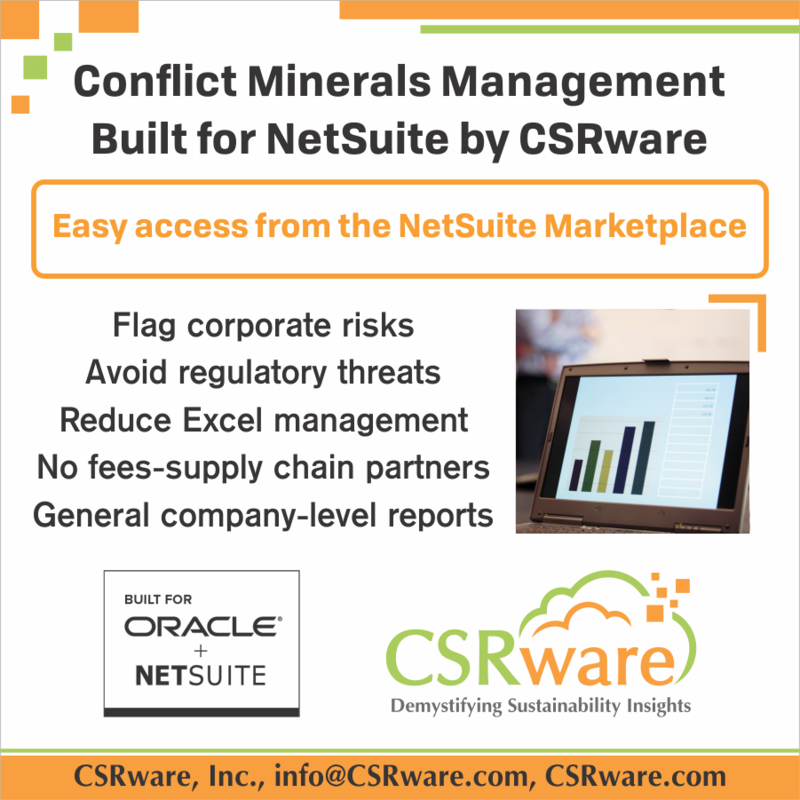 MILL VALLEY, Calif., Dec. 7, 2018 /PRNewswire/ -- CSRware, a leading cloud-based Environmental Sustainability Management software provider, announced today that two of its products, Responsible Supply Chain and Conflict Minerals Management, have achieved the "Built for NetSuite" status. The new SuiteApps, built using NetSuite's SuiteCloud Computing Platform, provide the ability to embed a responsible compliant supply chain into your procurement process by surveying suppliers, measuring environmental, social and governance performance, assessing risk, meeting supplier code of conduct adherence and eliminating the need to collect this information via Excel spreadsheets. Built for NetSuite is a program for NetSuite SuiteCloud Developer Network (SDN) partners that provides them with information, resources and a method to help them verify that their applications and integrations, built using the NetSuite SuiteCloud Computing Platform, meet NetSuite's standards and best practices. The Built for NetSuite program is designed to give NetSuite customers additional confidence that SuiteApps have been built to meet these standards. "CSRware has identified a critical need in the supply chain process where companies are now required to provide in-depth information about their suppliers and potential environmental and social impacts to the success of both the buyer and supplier," said Karen Alonardo, CEO, CSRware. 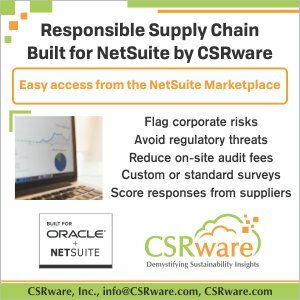 "With the CSRware SuiteApp integration, NetSuite customers can streamline their reporting processes, while attaining confidence their suppliers are in compliance with environmental, social and governance requirements," said Guido Haarmans, Vice President, SuiteCloud Developer Network and Partner Programs. "Their unique applications provide value to our customers and SDN program." For information about Built for NetSuite SuiteApps, please visit www.netsuite.com/BuiltforNetSuite. For information about the integration solution, please visit www.suiteapp.om and search for CSRware. NetSuite's SuiteCloud is a comprehensive offering of cloud-based products, development tools and services designed to help customers and commercial software developers take advantage of the significant economic benefits of cloud computing. Based on NetSuite, the industry's leading provider of cloud-based financials / ERP software suites, SuiteCloud enables customers to run their core business operations in the cloud, and software developers to target new markets quickly with newly-created mission-critical applications built on top of mature and proven business processes. CSRware® provides a suite of Corporate Social Responsibility software products powering business to meet a higher standard of accountability and transparency solving society's most challenging environmental, social and governance challenges. Our software solves the problem of bringing your business and its non-financial data together in one intuitive platform replacing complex Excel data management. With CSRware, you can generate immediate insights into sustainability performance, risk mitigation, being audit ready, and business continuity by collecting, analyzing and making information digestible for the entire value chain to succeed. With one platform, your company can access one or many modules to address: Responsible Supply Chain built to enable a sustainable procurement process (Responsible Sourcing, Anti-Slavery, Human Trafficking, Labor Conditions), Conflict Minerals Management, (3TG, Dodd-Frank SEC Reporting), CSR / Sustainability Reporting (includes: B Corp Assessment preparation, adherence to Benefit Corporation Legal Structure, Sustainability Accounting Standards Board (SASB), Dow Jones Sustainability Index, Global Reporting Initiative, Carbon Disclosure Project), and Environmental Management (Air Quality, GHG emission standards, all KPI's / metrics on resources, ISO 14001, 14004, 50001). For more information on CSRware, please visit CSRware.com.